Seat will be available on first come first serve basis. All ticket Price Includes Pre Event Snacks Drinks and Buffet Dinner. 2 Bottle of wine will be served per table. In case of any leakage on social media, He/She will be liable for any legal implications by Event Organiser. Maheep Singh is an unassuming man with plenty of stories to and comedy to tell. Fortunately for us, he believes in sharing his experience and comedy. Mr Singh is the kind of character that TV writers aim to pencil into their intelligent. He sounds a lot like Eeyore from Winnie the Pooh but somehow, his sad/mundane story is hilarious. Known as ‘The Gujarati Sardar’ in the stand-up comedy circuit, Maheep started stand-up comedy as part of his coming out of depression exercise. He had a choice between serial killing and stand-up and he chose stand-up. He uses his personal experiences and observations in general in his comedy and all of the things he says in his routine are facts. Manish Tyagi used to be a Commander in the Indian Navy before he decided to become a stand up comic. An Officer and a Gentleman who was forced into singledom at 48, he has some very funny tales to tell from his life experience. Manish’s style catches you unaware to deliver unprecedented stories of wit and humour. 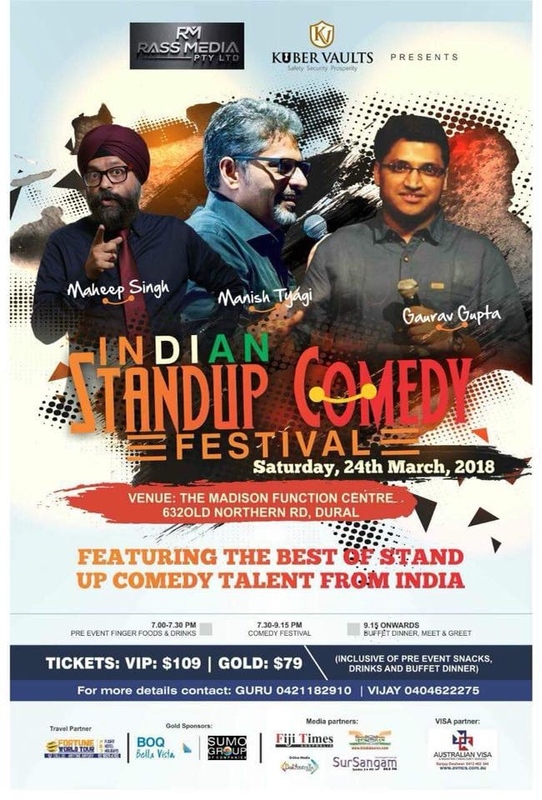 Gaurav Gupta is a professional comedian based out of the capital city of India, New Delhi.He is extravagant when it comes to delivering jokes. He is a dentist by profession and a comic by “recession.”He is a keen observer of daily life and his comedy involves people and the funny encounters with them.Gaurav has won various open-mic competitions and has performed in numerous gigs.Get ready to have all your teeth out with his deadly combination of comedy and dentistry! Premier Tickets is an online event marketing and ticketing agency. Premier Tickets will NOT be responsible for any changes related to the event schedule, artist, venue or cancellation and refunds related to the tickets for Indian Standup Comedy Festival Live in Sydney Event.